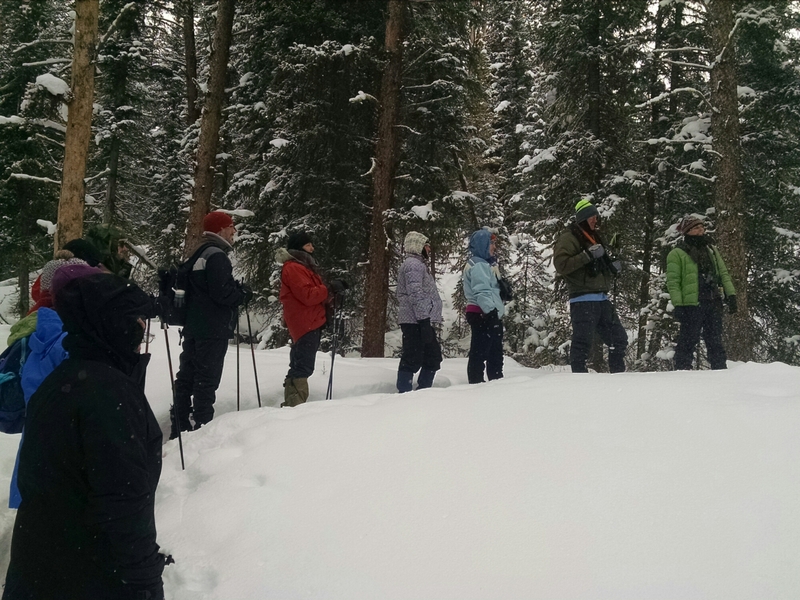 Since 2006, the Museum has offered a winter trek to Yellowstone National Park for educators. 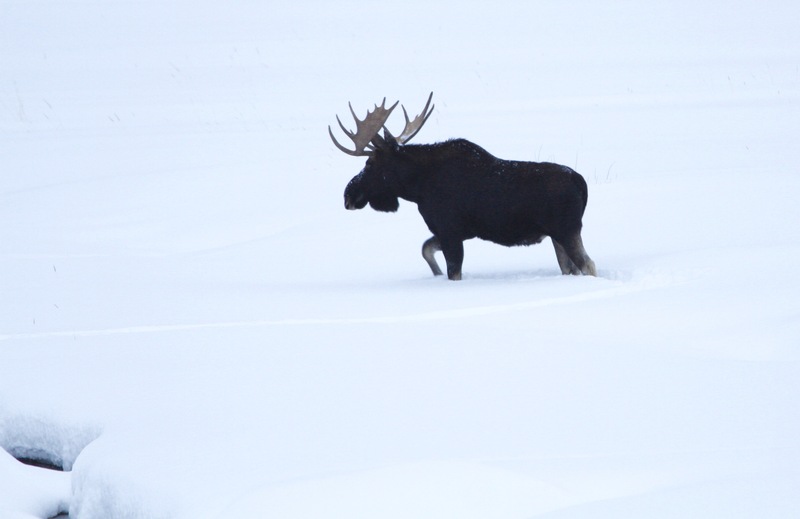 Snow blankets the landscape, steam fills the air in the geyser basins and wildlife struggles for survival. 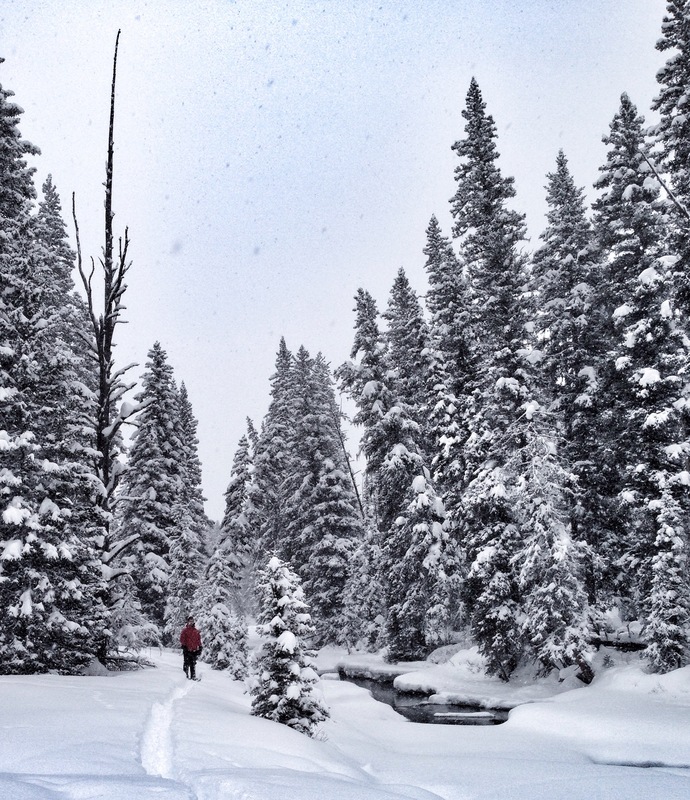 Yellowstone in the winter is a truly unique experience. 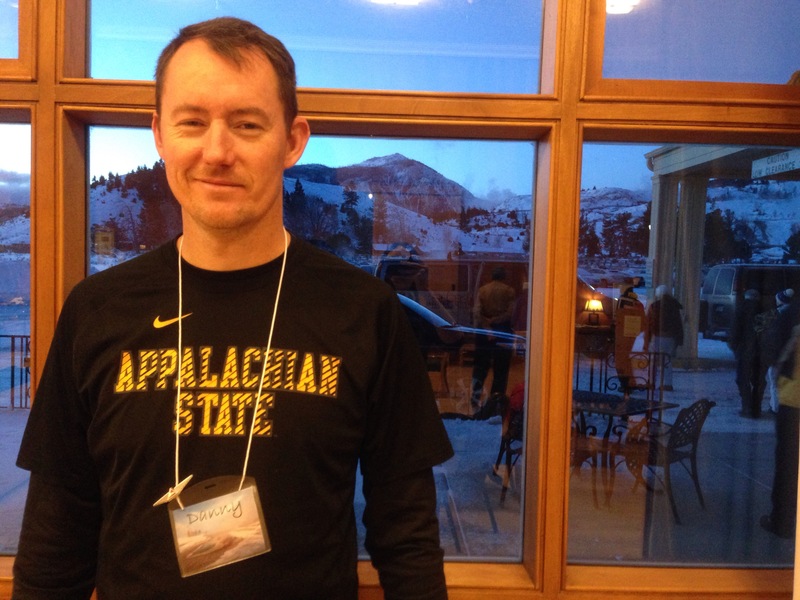 Applications for January, 2016 are available now! To request an application, email Melissa Dowland at melissa.dowland@naturalsciences.org. 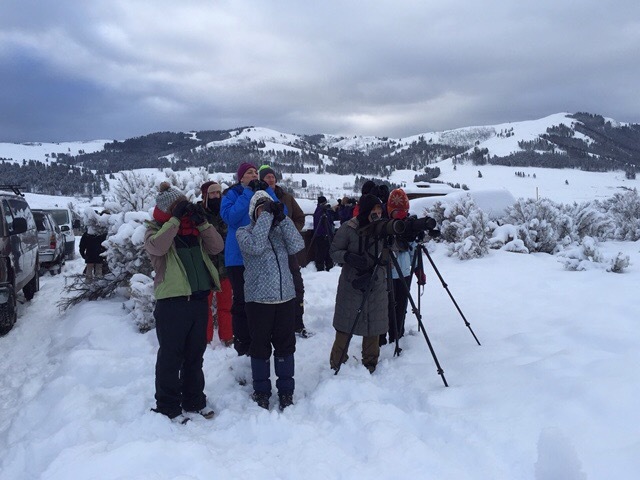 Follow our journey through Yellowstone’s winter landscape by reading our blog posts and visiting our photo gallery. Today we headed back down into Lamar valley to meet with Kira from The Wolf Project of Yellowstone. As we watched the wolves from the Junction Butte pack make their way up the hill, we learned that the wolf pack is very much a family, taking care of, playing with and defending each other. Continuing on through Lamar valley we spotted a bull moose resting in the willows, bighorn sheep on the side of the hill, a coyote making its way trotting across the field, coyotes under a tree barking and yipping, and a lone golden eagle perched in a tree. Strapping on snowshoes at Lower Barronette Peak, we broke trail through deep snow and headed down by the creek. Fresh tracks! We followed and searched. Out of the deep snow came an ermine! We instantly became giddy children running back through our fresh paths just trying to grab one more glimpse of the curious little weasel. Then, just as quickly as it appeared, it was gone. Our last full day at Yellowstone was packed full of everything we could fit in. It seemed as though each of us was desperate to capture each second, each moment, to hold in our hearts as we come back to our lives in North Carolina. We made one last stop on the way back to the hotel to admire the clear sky and bright moon– so bright that it cast shadows on the snow, and it gave us one more chance to embrace the wildness and the peacefulness we had been experiencing during our time here. So, even if we only keep 10% of the new things we’ve discovered about ourselves and Yellowstone, I hope we keep a little wildness, a little peace, and wide-open hearts in every moment of our lives. We began our day in the cold dark early morning hours with a sunrise drive to find the amazing wildlife that is Yellowstone! Our first stop was a moment of silence in the gray morning light overlooking Hellroaring Creek. 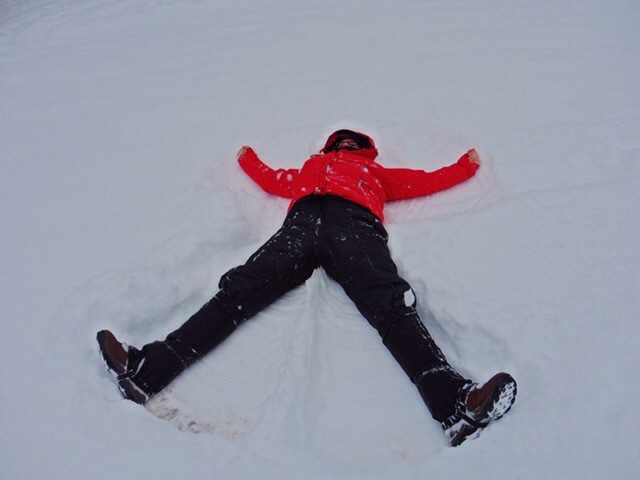 We spotted some elk grazing through the freshly fallen snow and even had time for Kevin to make a few snow angels. We could smell the sulfur in the air as we traveled over the Lamar river and through a thermal area of sulfur springs. We continued through the sunrise on our way to Little America, where we took a moment to scan the mountains for any kind of wildlife we could find. Chris and the weather/wildlife team took their measurements and we were again on our way again after spotting a few herds of bison. 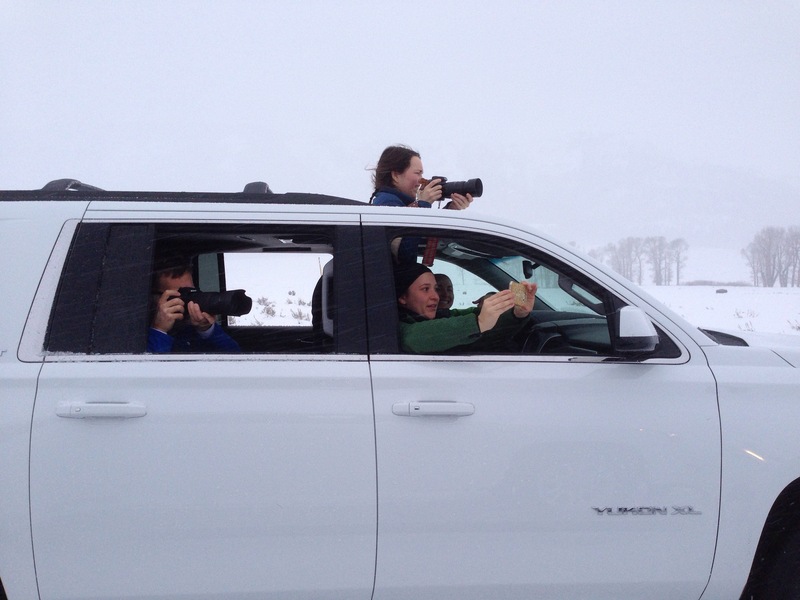 Despite our efforts to be out as early as possible and beat the herds of wolf trackers, we pulled up on Slough Creek where we were greeted by photographers, videographers, and wolf watchers. We were able to spot a gray wolf walking along the valley, and she would occasionally send us a loud howl. There is no better sound in the world than hearing the howl of a wolf who is walking along in the distance, right in your scope. When we began hearing additional howls and the response howls from our wolf, we realized that this lone wolf’s pack must have been closer than we thought. The wolves are beautiful and definitely cute, but these canines are better left to the wild. Off and down the road a few minutes, Danny was able to spot two (6×6 and 6×7 – the number of times on each antler) bull elk resting and grazing in an open field on the side of a mountain. We quickly grabbed the scopes and ran out to see the magic. These animals are spectacular and magical, an animal we consider ourselves lucky to have been able to see so clearly. Traveling on down the road we came to a surprisingly amazing detour. 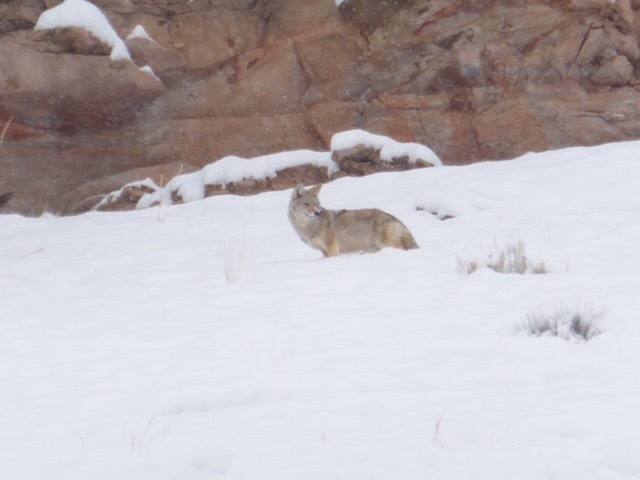 At the confluence of the Lamar River and Soda Butte Creek, we spotted a coyote, familiar to us all as we had seen many coyotes since we have been here. But we have been itching to see a kill. 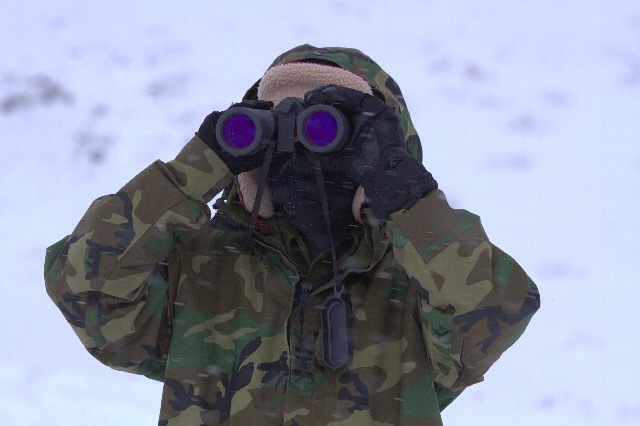 We slowly pulled over, watching as our furry canine friend followed the sound of a small subnivean creature (mouse or other small mammal) beneath the snow. He paused, cocked his tail, and we all went wild as he dug his face down into the snow and pulled out his head chomping on his lunch. We had witnessed the kill! 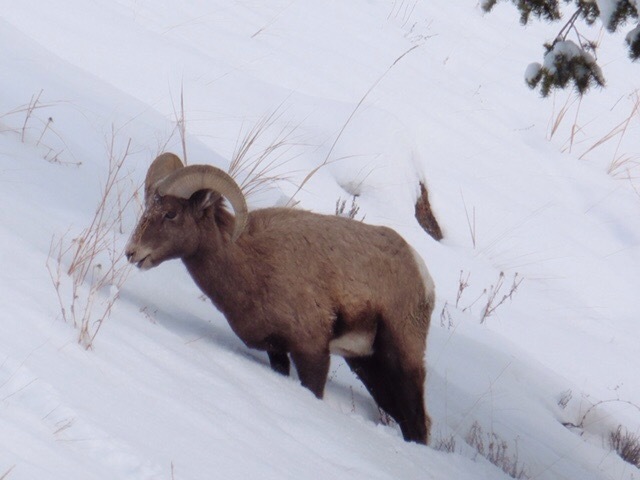 While we were out there watching the coyote hunting for more, we didn’t realize that there were 3 bighorn sheep watching us! 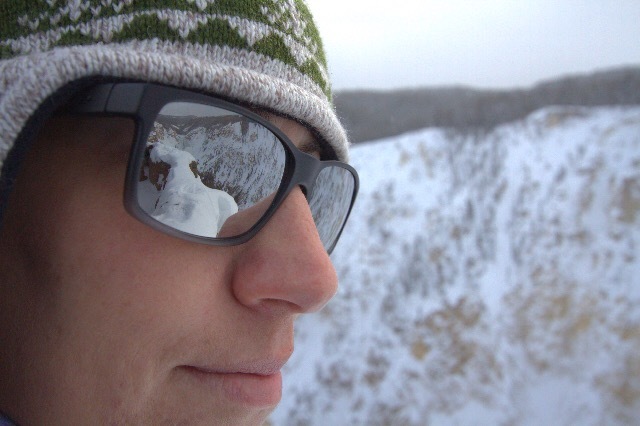 We quickly adjusted our binoculars to see six lazy eyes peering over the ridge. 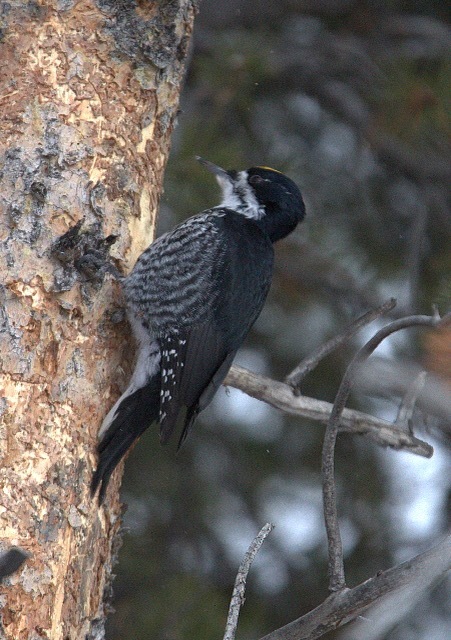 While out on the road we also saw a raven overlooking the landscape, a dipper diving for larva in the stream, and a beautiful black and white magpie flying from tree to tree, showing off her wing patterns. 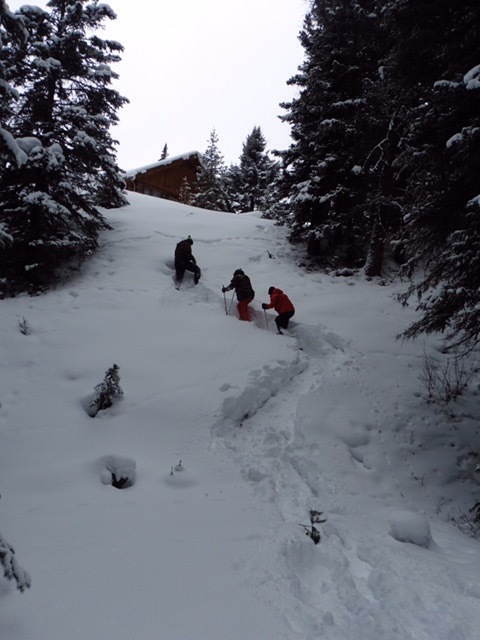 Snowshoeing up a steep hill is hard work! After a wonderful meeting with Dan Hartman, wildlife photographer and naturalist, we headed back on the road again where we went searching for more wildlife. We found mountain goats, bison, and the find of the day… One cow and one bull moose!! Talk about spectacular! As the day comes to an end, we can safely say that Yellowstone delivered for us today. 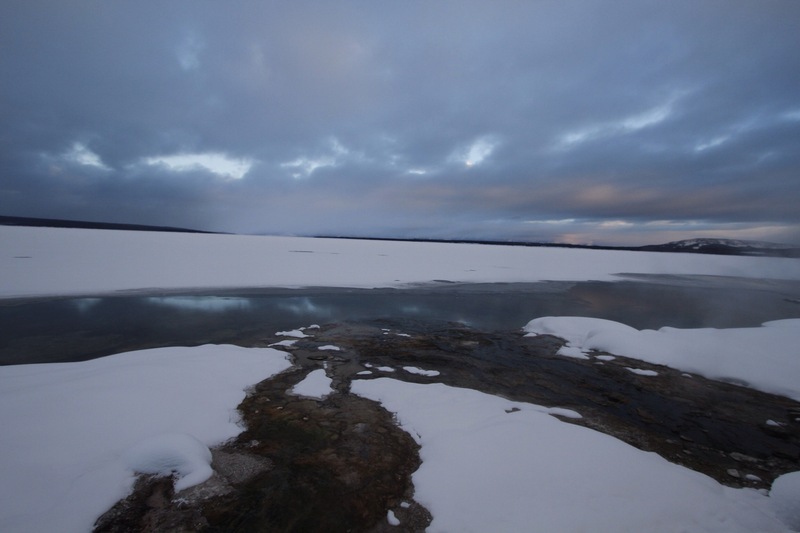 We look forward to the next few days and the connection this incredible place is allowing us to make to its vast magical winter landscapes and ecosystems. We know one thing is certain, we are visitors here exploring this world that belongs to all of these amazing creatures, and we have cherished every second of this insightful day. The morning began with light snowfall and grey skies in Upper Geyer Basin. As we rounded the corner of the visitors center, there it was: Old Faithful. We weren’t certain if we’d timed it right, but Old Faithful geyser did not disappoint. Just as we finished talking about geology, three dull “thumps” could be heard, and then great clouds of steam and water started shooting into the sky. Thus began our lucky day! Our hike through the Upper Geyser Basin gave us several other exciting and unexpected geyser eruptions in addition to Old Faithful: the little Anemone, Grand and Turban, and finally Riverside Geyser! 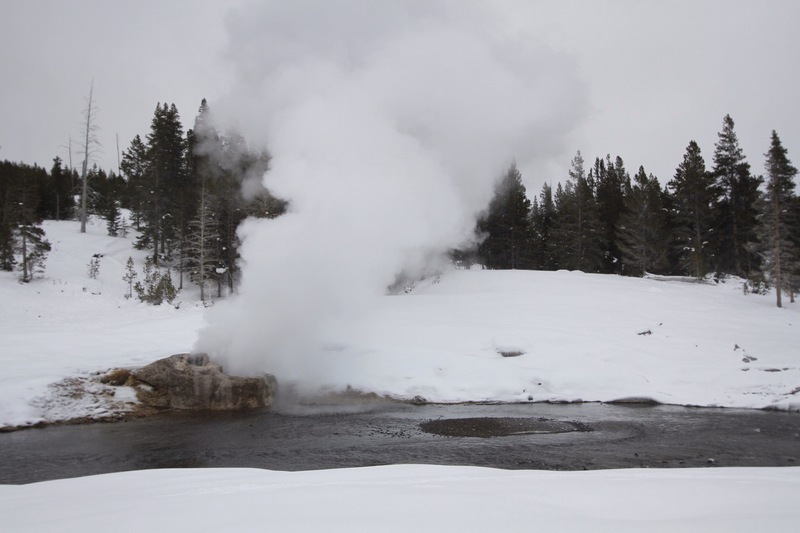 Throughout our journey north from the Old Faithful area back to Mammoth, we scored six coyote sightings, witnessed herds of bison “snow ploughing,” and experienced the rumbling of the Earth’s crust while lying around the Black Sand pool (a hot spring). The whole day we felt and witnessed the delicate balance of life in this beautiful, yet harsh environment. 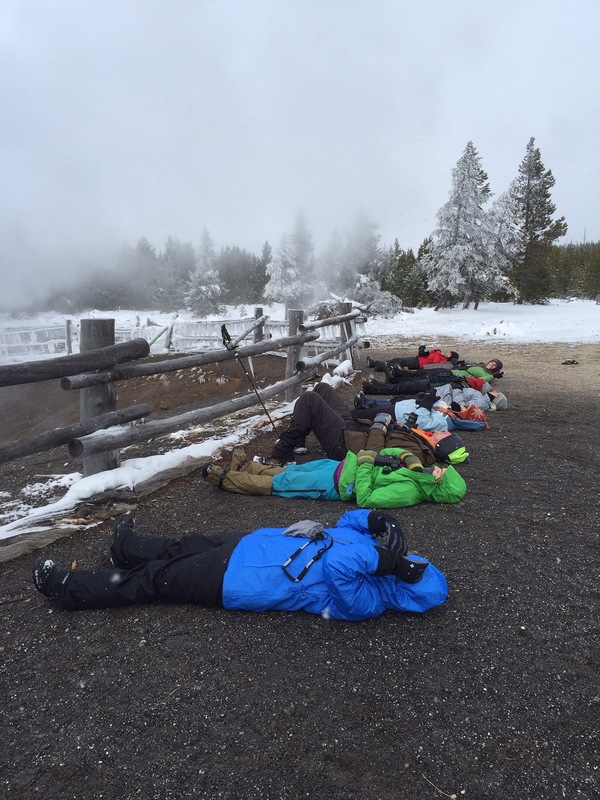 We could feel the thumping of small steam explosions while laying on the ground at Black Sand Pool. 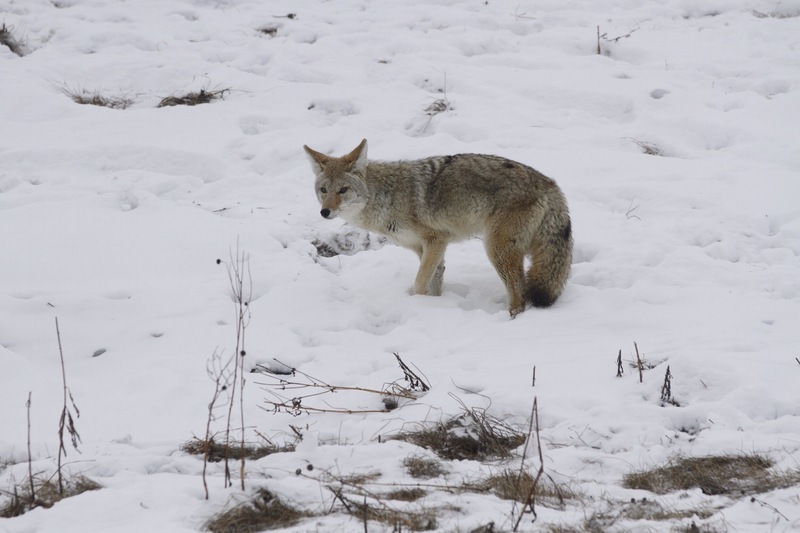 One of the six coyotes was listening for prey – small mammals moving beneath the snow.